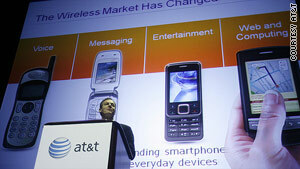 AT&T spokesman David Christopher speaks at Wednesday's announcement. (CNN) -- AT&T announced Wednesday plans to launch five smartphones running Android -- the communications giant's first venture with the Google-created operating system. The devices will be from Dell, HTC and Motorola and are scheduled to be available in the first half of the year, the company said. AT&T Mobilities president and CEO Ralph de la Vega also said AT&T plans to offer two Palm devices within the same time period. News about the phones came as part of an announcement in Las Vegas by in AT&T, which already sells and provides the 3G service for Apple's iPhone. The company also announced an "apps for all" program that it said would expand smartphone-style applications to more mobile phones and spur more app development for phones and other devices. "Our goal is to bring more apps to millions more of our customers who want convenient access to the market's hottest apps," de la Vega said in a written statement. "At the same time, in the future, we plan to go well beyond mobile devices to spur apps development." The initiative will include providing more technical support to app developers, including live chat, a standardized 70-30 revenue share split for third-party developers and a virtual network environment that will let developers test out their apps. "Today, developers must essentially rebuild apps for different handsets and operating systems, increasing their costs, slowing the pace of innovation and stalling the delivery of mobile apps to customers," said AT&T marketing chief David Christopher. "We want to tear down the barriers and make it much easier for developers to reach our customers -- and for our customers to access apps." The company said its goal is to offer access to the app stores of all major smartphone operating systems. AT&T customers with one of the five new smartphones will be able to talk on the phone while surfing the Web or reading e-mail, according to the release. The announcement came one day after Google announced it would be entering the market with its own smartphone, the Nexus One, which also will run the Android software.